Mitäs tälle projektille kuuluu nykyisin ja onko jotain noita en. meshejä saatavilla jostain? Ois just hyvät jälkimuokkaus softat koneella. Omalta osaltani tämä on yksi niistä vielä joku päivä projekteista. Tarkoitus on jatkaa osaien mallinnusta vielä tulevaisuudessa. Korin mallejakin olisi ihan mukava saada, vaikka taito ei niiden muokkaamiseen oikein riitäkään, eikä ole siihen ohjelmiakaan. I'm new to FinnShark and I'd like to ask if anyone has the dimensions from the wheel centerlines to any body mount on a C3? 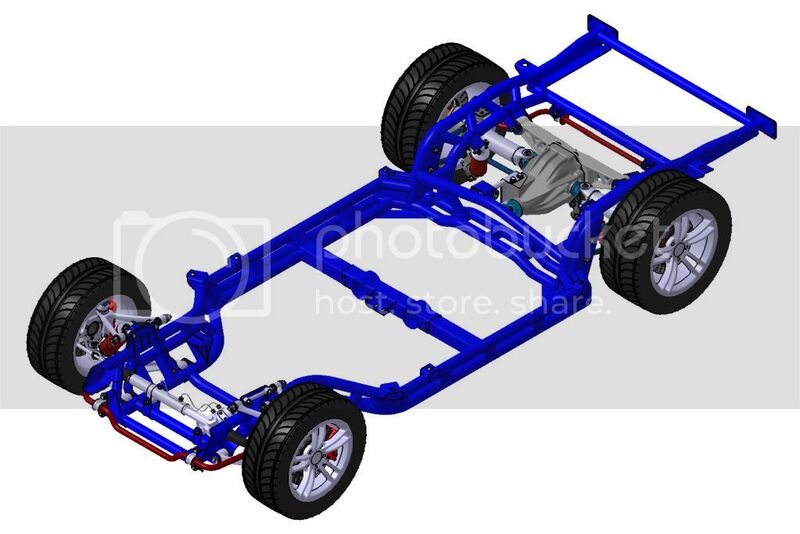 I'm designing a chassis based on the SRIII tubular frame with a C5/C4 IFS/IRS setup. I'm stuck overseas at the moment so I don't have access to any vehicles to measure the hard points. The Chassis diagrams are where I started. Then after much searching, I was able to create the two frames (side & rear exhaust). The front suspension is complete and the rear just needs a sway bar. I just need to be sure I have my wheel centerlines in the proper locations. 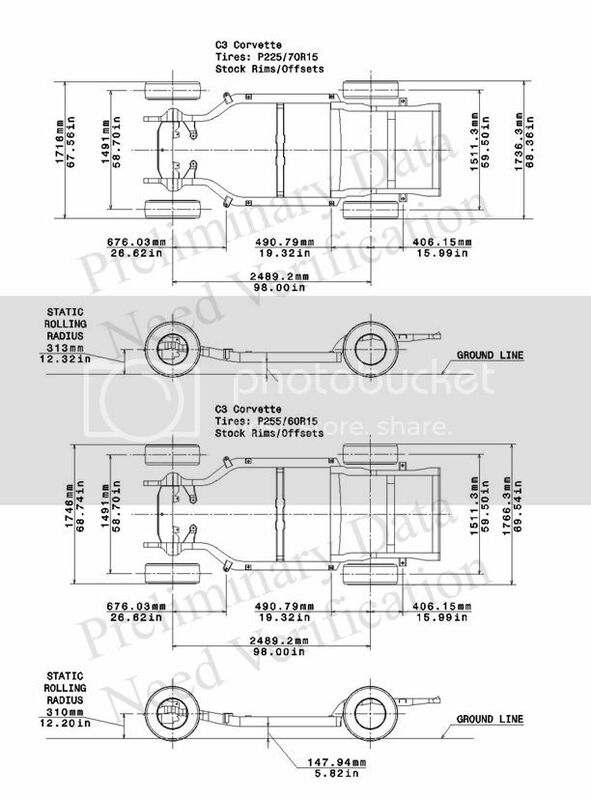 Here are the wheel centerlines to body mounts that I have currently. I need help to verify these dimensions. I am trying to keep the tires inside the original body without adding flares. I noticed many owners out there upgraded their tires to P255/60R15 which fills the wheel wells quite nicely. Please, any help would be appreciated. I'm using CATIA V5 as my CAD software. If interested, I have some pics of my progress on a couple of websites. Interesting project! Your chassis looks marvellous! Unfortunately I'm also oversaes and can't measure those dimensions for you. On the other hand it is a bit difficult to measure them from a car with body on. I know that few guys here have their body offs going on. Maybe they will have time to measure body mount positions for you. You seem to have dimensions for longitudinal positions already, do you need to proof those dimensions? Do you have width of the body mounts? That dimension is missing from your drawing. Very interesting project that you have going on there! I'm using Catia V5 in my work too and I have modelled some parts for fun from vette. But nothing compared to the work that you have made! Here is where I started. I got the frame dimensions, but the are no wheel centerlines. The Track (58.7in/59.5in) width and Wheelbase (98.0in) are per the Chevy specs. When I saw this thread I was hopeful to share/swap our 3D data.